Banana Cake - Pressure Cooker Method | Simple and Delicious ! Peel and chop banana into long or round thin pieces. Heat little ghee in a frying pan. Fry the banana pieces in that. See the procedure for making 'pazham vaattiyathu'. When it is done allow to cool. Break and keep the eggs in a bowl. Blend it together with cardomam ,sugar and roasted banana. Grease the bottom and sides (use little ghee). Pour the blended solution into this. Sprinkle cashews and raisins over this. Do not put the weight. Cook on a low flame for few minutes. You have to take extra care at this time, excess heat may burn the mixture. After few minutes (I think less than 10) if you notice a nice smell, switch off the fire. 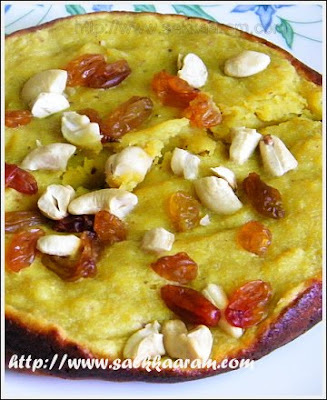 Oh wow cake in the cooker interesting and looks delicious too.. easy one too.. will try it out. assalamualaikum seena...wel all ur recipes r really gr8..but seena drinking lemon juice during iftar is not good for ur stomach[ drinking any kind of citrus fruit juices like orange ,lemon etc]..because due to fasting ur stomach will b highly acidic...to this acidic nature if u add more acidic[citric acid] juice.it ll harm ur stomach...so try avoiding it...so waiting 4 ur more mouth watering noombu recipes..shahna. Can I get one piece from that? Looks so soft and Yummy. Wow never made banana cake in a pressure cooker before, has come out lovely! Interesting recipe, Seena! I was expecting flour to be an ingredient in this recipe. But tell me, doesn't it taste/smell eggy? so different cake..without flour...looks very nice. 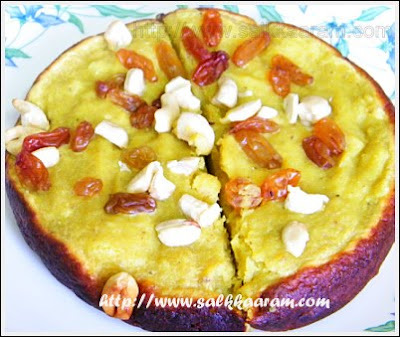 Lovely looking cake mashalla..Do we use plaintains or ordinary bananas for this dish? Wow...the cooker cake looks yummy! is this nendra pazham or chiquita which we get in dubai? I am a follower of your blogs, and I have come across many recipes that I love using to alter my cooking sometimes. 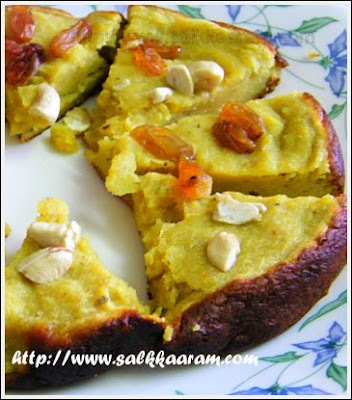 This cake can also be made in a Tefal (non- stick) vessel that most Malayalees use for biryani and such like. You can also cook it the way you cook the malabari biryani, by heating the bottom and top of the vessel, and that way, you can avoid burning at the bottom of the cake. if you don't fry bananas cook it by boiling. Good luck!